For an author to write an effective book of halachah, Jewish law, the gift of clarity is indispensable. To set forth hashkafah, the Torah perspective on life, an author must possess the ability to inspire and enlighten. 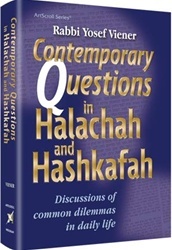 In Contemporary Questions in Halachah and Hashkafah, Rabbi Yosef Viener offers a rare combination of both: clear, easy-to-follow halachic guidance together with hashkafic explanations that illuminate our daily lives. 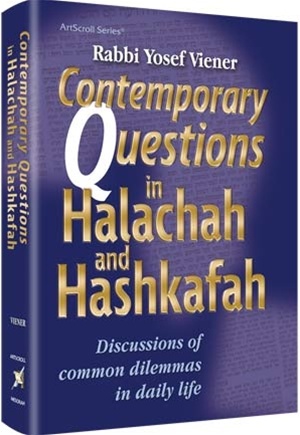 Contemporary Questions in Halachah and Hashkafah offers readers practical, relevant, and unusually readable answers to over a hundred inquiries from all over the world. The range of questions is astonishing, and reflects the variety of experience in our world. My son wants to make a snowman on Shabbos; is he allowed to do so? My elevator went into free fall until the emergency brakes kicked in - do I have to "bentch gomel"? What is the best way to prepare for a possible Shabbos birth? I can go to a Torah shiur or a wedding - which has precedence? Do we believe in "luck" - and what do we mean when we wish someone "mazal tov"? Using such questions as a starting point for discussion, the author includes many general guidelines on each topic, as well as penetrating insights into the mitzvah. Here is a wealth of both information and inspiration; thus, a question of whether a teenage boy should wear tzitzis while exercising ends with a poignant discussion of the commandment, drawing upon the experiences of people as diverse as King David and the Vilna Gaon. Extensive footnotes make this work an invaluable resource for scholars, and a detailed index allows the reader to quickly find the answers to questions that come up every day. From dealing with competition in the marketplace to taking allergy medicine on Shabbos; from waking a parent for an important business phone call to the halachos of bar mitzvah: this is a book as rich and varied as our own lives.